Visible Legacy Navigator is helping Industry Affiliates navigate the Stanford School of Engineering. A visionary proposal for the Stanford Center for Integrated Systems was written in 1978, becoming the model for Industrial Affiliate programs at modern universities. Visible Legacy is now mapping these projects at Stanford School of Engineering and beyond. We invite you to participate as we help the ecosystem make connections faster. The late 1970s demanded a new era of innovation in Stanford's electrical engineering curriculum. The advent of the microprocessor at Intel introduced electronic hardware controlled by software programs integrated in the system. Linvill and colleagues foresaw that optimum system design would soon require the creation of hardware and software designed for specific applications – computer graphics, for example – and that groundbreaking research would require an effective partnership between electrical engineering and computer science. 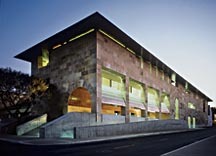 The result was Stanford's Center for Integrated Systems (CIS). Linvill and CIS colleagues anticipated, as well, that with the proper openness, integrated systems research would profit by engaging with forward-looking electronics companies. As co-director of CIS, Linvill conceived and implemented a visitors program in CIS to bring industry professionals to Stanford and the Fellow/Mentor/Advisor (FMA) program that placed Stanford doctoral candidates in industry for a portion of their education. More than 30 years later, CIS has become the model for university-corporate partnerships. The Stanford School of Engineering continues to offer and expand Industry Affiliate Programs across disciplines. These programs are a boon for Industry interested in funding targeted research and for Tech Scouts seeking to license new inventions and find grads and postdocs with new knowledge. It can be daunting, however, to find relevant projects and investigators, for example, or spot government grants funding an emerging technology hotspot. It is a fast-moving activity and with often-changing organizations. For example CIS is now re-branded as "Stanford SystemX". As with many other searches, a visual representation or map helps navigate the ecosystem. Visible Legacy developed the Navigator portal to help Industry fundors and licensees find a fit faster. 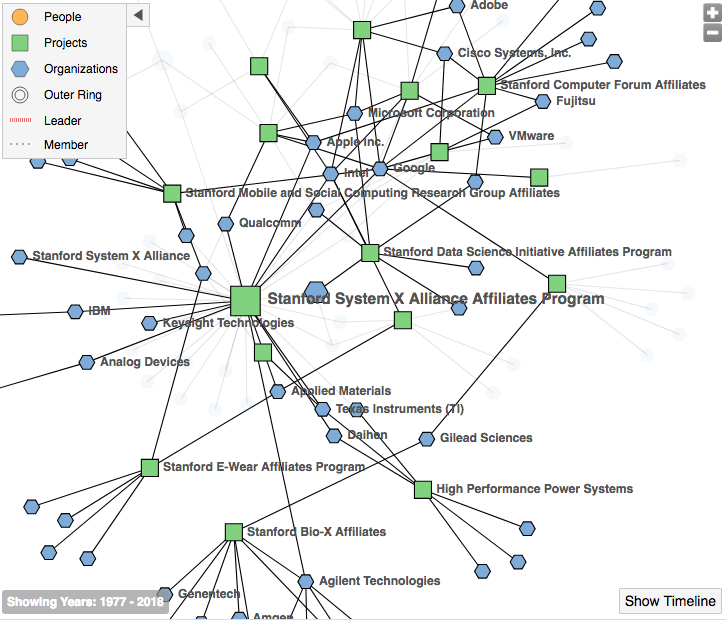 Our maps show the various Affiliate programs across Stanford School of Engineering. In the map below you can see the ecosystem around the Stanford SystemX Alliance. You can then drill down to the Investigator Lab level to find PhDs and Post-Doctoral Research Fellows or technology available for license. You won't find these maps in the public Navigator, however ... not yet. We are still gathering the data and creating the mapping taxonomy to be most useful to users. We are seeking sponsors by program to expedite this work. Sponsors can participate in our user interface enhancement and will get an early look at data. Many Industrial funders support research across multiple universities. We are now expanding our dataset and maps to the top 25 research universities. See our top 25!